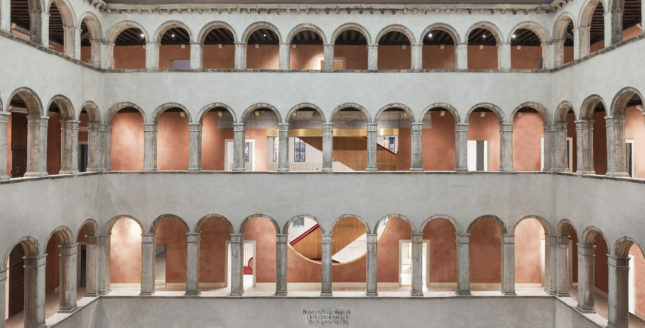 International practice OMA has completed a refurbishment of the Fondaco dei Tedeschi in Venice. 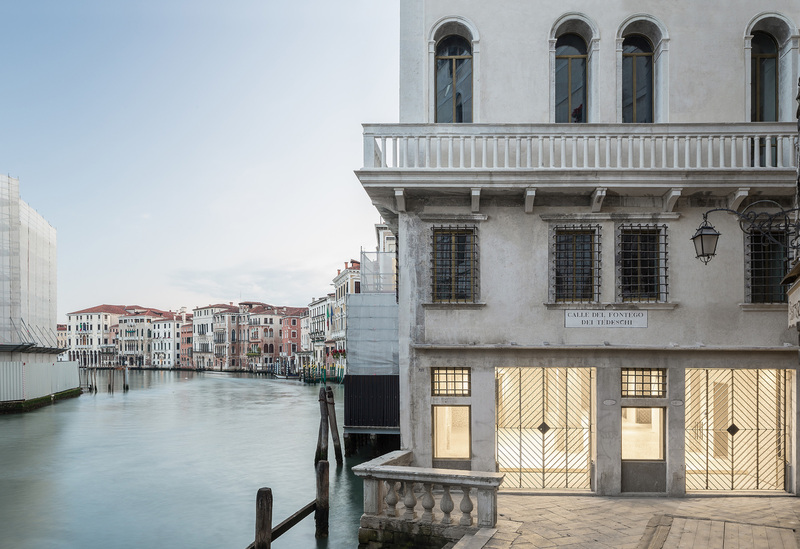 Originally constructed in 1228, rebuilt in 1508 after a fire, then given a concrete structure in the 1930s, the Italian Renaissance-styled building is an emblem of Venetian Republic. Having served many purposes throughout its lifetime—used by German trade merchants, then as a customs house for Napoleon and a post office for Mussolini—the Fondaco dei Tedeschi was granted “Monument” status in 1987. 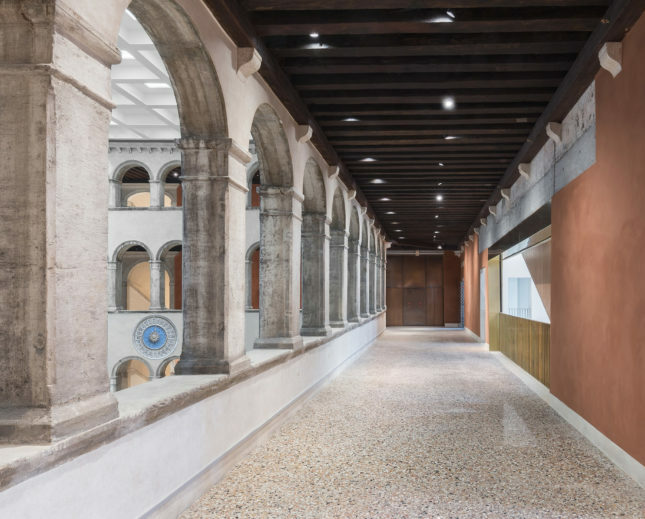 Four years later, Benetton and OMA’s plans have been scaled back to incorporate an artistic element, thus maintaining Venice’s cultural pedigree. 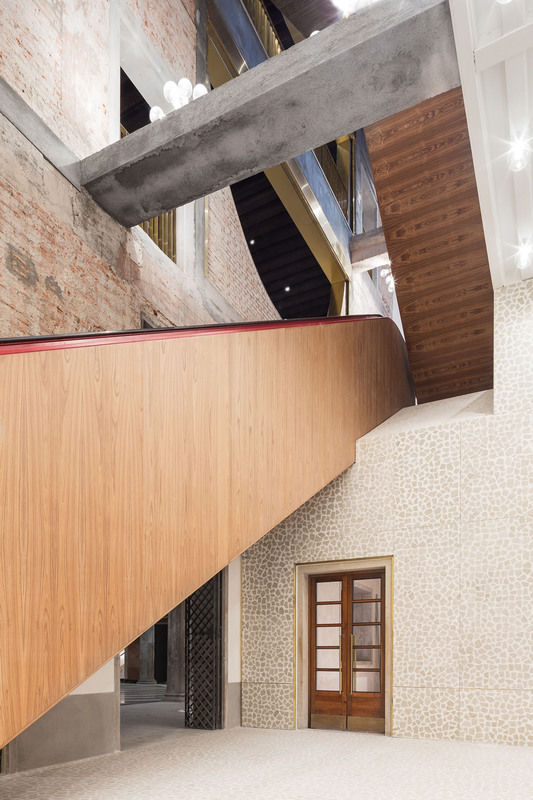 Opening the courtyard piazza and rooftop to pedestrians facilitates views down into the building and, more impressively, over Venice along the city’s canals. 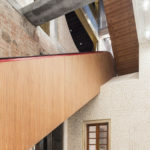 The most drastic intervention comes in the form of the structure’s circulation. 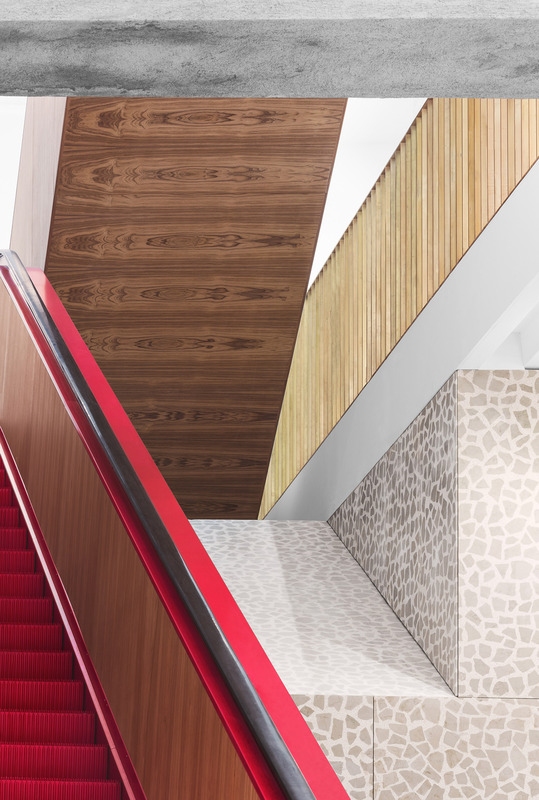 Timber-clad escalators rise up through the volumes, punctuating the space with their dark red coloration, seemingly an amplified reference to the pink hues found in the worn bricks of the interior. 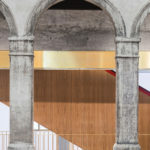 In order to encourage circulation to the building, new entrances from the Campo San Bartolomeo and the Rialto have been created, while the existing entrances into the courtyard have been retained for the locals. 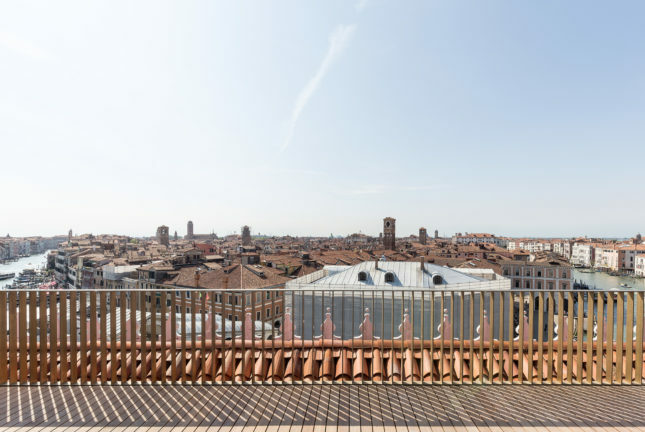 OMA created a new rooftop through the renovation of the existing 19th Century pavilion at the top and the addition of a large wooden terrace, which now offers spectacular views over the city. 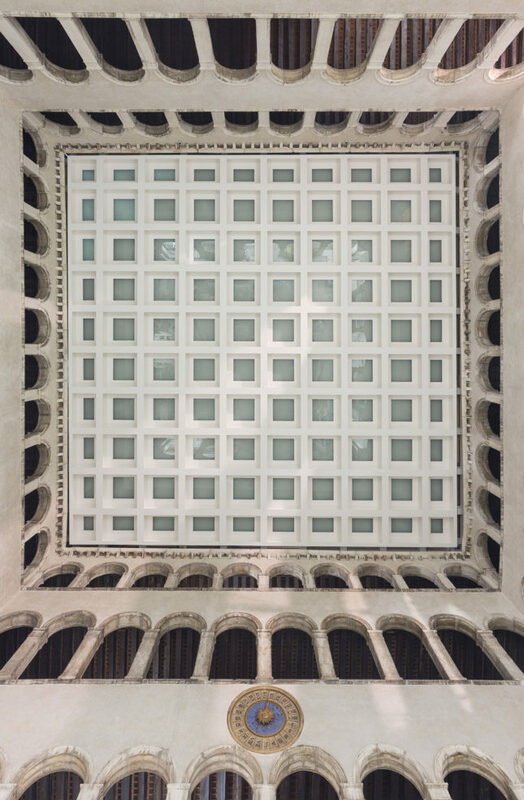 Both the rooftop and the central courtyard below will remain open to the public. 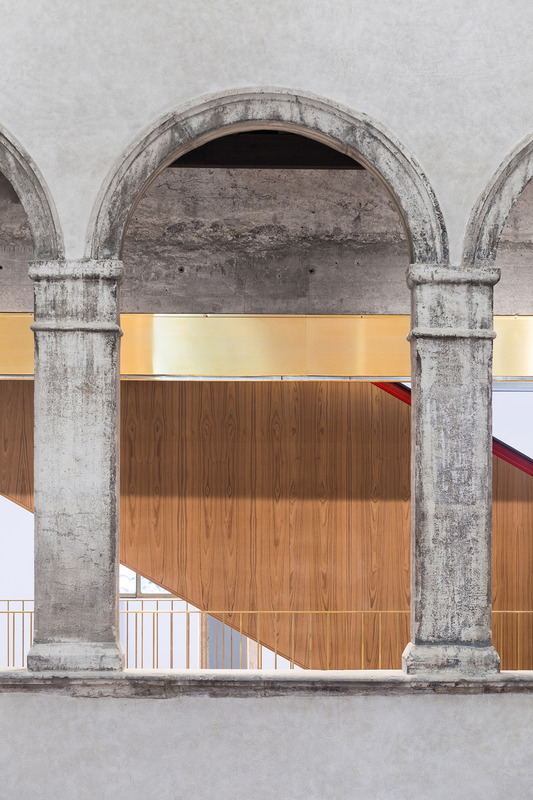 “The transformation of the Fondaco is based on a finite number of local interventions and vertical distribution devices that support the new program structure a sequence of public spaces and paths, from the central courtyard to a new roof terrace overlooking the Canal Grande,” said OMA. 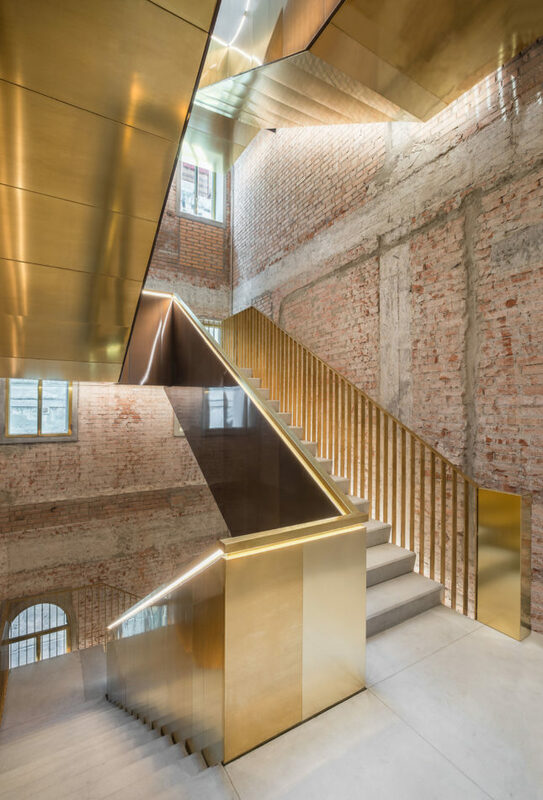 “Each intervention is conceived as a brutal excavation through the existing mass, liberating new perspectives and unveiling the real substance of the building to its visitors,” they continued. 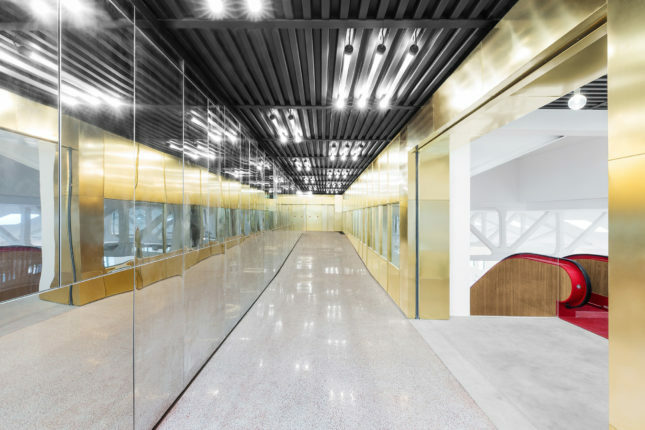 “With an almost forensic attitude, each new component serves as a way to show the stratification of materials and construction techniques.” As for the retail space itself, Jamie Fobert Architects from London will lead the design. 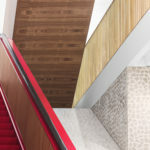 The renovated building is due to open in October this year.